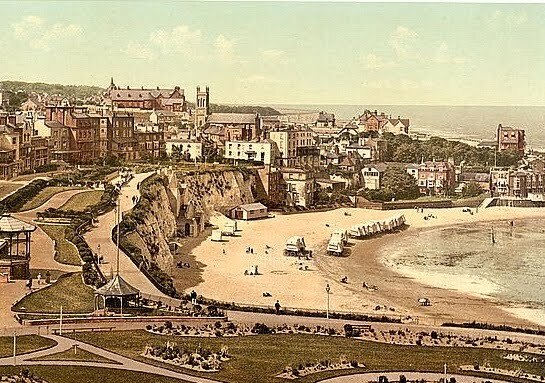 The town of Broadstairs in Kent – where much of Conversations with Spirits is set – actually has a number of literary associations. “You cannot think how delightful and fresh the place is and how good the walks,” he once wrote. His letters show that Dickens was nostalgic for the little Kent town, even when he was holidaying abroad - and he went on to introduce a number of other literary figures to Broadstairs, including Hans Christian Anderson and Wilkie Collins. There are two museums to the author in the town: Dickens House, with a faithful reproduction of Betsey Trotwood’s parlour, as described in David Copperfield. And ‘Bleak House’ (formerly ‘Fort House’), Dickens favourite holiday retreat from the mid-1840s, with many rooms preserved as he knew them. Oscar Wilde regularly visited his sponging, wastrel brother, Willie, in the town - always staying at The Royal Albion Hotel (or ‘Ballard’s Hotel’,* as it was then). During the First World War, John Buchan wrote The Thirty-Nine Steps whilst convalescing at a cliff-top nursing home in Broadstairs. More recently, Bruce Robinson, the writer and director of the cult comedy Withnail and I, set his first full-length novel The Peculiar Memories of Thomas Penman in Broadstairs. Like Withnail and I, Robinson’s book is semi-autobiographical and the eponymous hero (‘a thirteen-year-old asthmatic short-arse with big ears and an unwholesome characteristic’) is based on himself and his similarly troubled childhood in Broadstairs. *Also where Arthur Conan Doyle is booked into in Conversations with Spirits. This is making me even more impatient! Get busy, Coleman!